This is a shot I took about eight months ago but didn't actually develop until this week. I'll not be doing that again. I'd delayed processing because I'd been using the Firstcall Superfine developer at the time and was having difficulty getting films to look the way I wanted. The first batch of Superfine worked really well with Tmax 400 but the second bottle I got was double strength or thereabouts and it didn't work as well for me. I just couldn't get the same consistency with the new stuff. Rather than using the Superfine, I put the roll, mostly containing night shots, away in a light tight bag until I could use something else. At the weekend I decided to mix some ID11 at 1+1 for the roll, cutting the development time a little from normal to help prevent the highlights from becoming too dense. The results were fine except for one thing. If you look at the sky in the scan below, just above the two street lights on the left, you might see the number 14 repeated twice. I've tried to show them through a tweak or two in Photoshop. The digits are lying on their side. I'm not sure how that could have happened but it looks like something from the backing paper has effectively been burned, for want of a better word, onto the negatives. The image above was the the third last on the roll so it's possible it's light fogging through the backing paper but I wouldn't have expected anything like that from film stored in a light proof jiffy bag in a drawer. I can only put that down to the length of time the roll sat around doing nothing much. It's annoying in as much as it becomes more apparent when I lighten the sky. I don't really like black skies in night pictures so I tend to raise the sky up a bit. When printing this one I might have to resort to some tricks to hide the "14s" such as a lower contrast exposure for the sky. If I peer very carefully at the actual negative using a loupe I think I can just make out the faintest pair of 14s imaginable, although it could be just that - imagination. I'll keep my fingers crossed that the issue doesn't manifest itself when I come to print it. Here's an innocent-looking iphone pic of the negative in question sitting on the lightbox. It all looks quite normal but there's no denying the 14s are there once scanned and subjected to levels and curves adjustments. 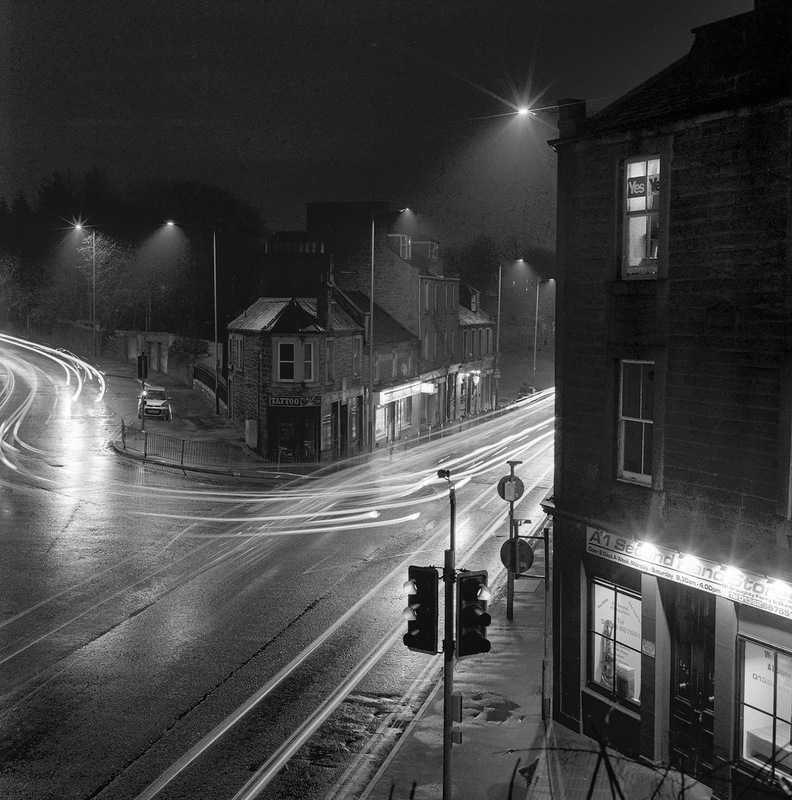 I remember the night I took this photograph as being mistier than it appears in the image. There's a light haze visible in the middle distance on the negative but nothing very dramatic. In my mind's eye, as I stood in the darkroom turning the developing tank up and down, I was expecting a Victorian London pea-souper to emerge. The pic was taken from the site of a bridge, demolished decades ago, that once formed part of the Dundee-Newtyle railway, the first railway to be built in the north of Scotland, way back in the 1830s. A decline in rail travel after the war led to the line closing to passengers in 1955. 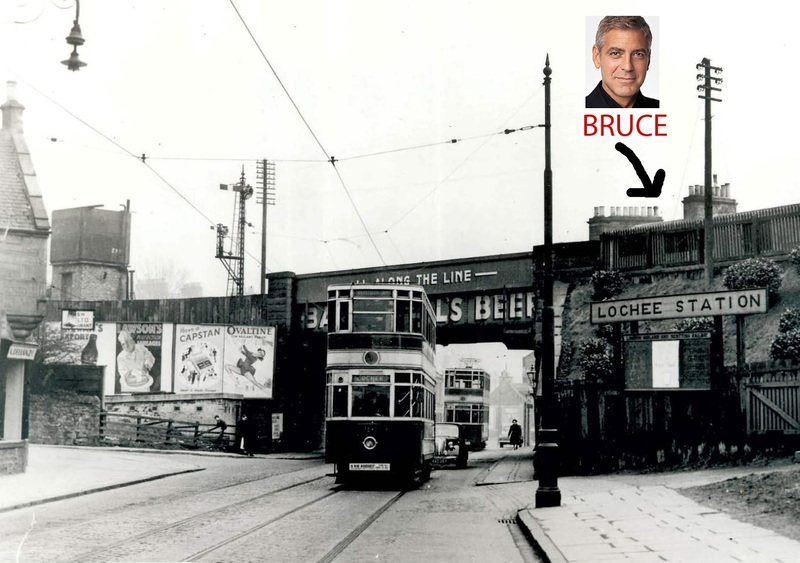 A few years later, the line closed to goods trains and shut forever in 1967. There was a spur leading from the bridge to Camperdown Works, once the biggest jute complex in the world, just a few hundred yards away. Much of the jute used in sandbags in the last year or two of the American Civil War came from that factory. Goods were loaded onto wagons which rode the railway right to the dockside. It was a very efficient set-up. Camperdown Works closed in 1981 but the railway bridge we're talking about disappeared in the early 1970s. I have vague childhood memories of it. Below is the bridge as it was in the 1940s/early '50s. You can see where I was standing. The camera is pointing under the bridge at the same junction I've photographed above. 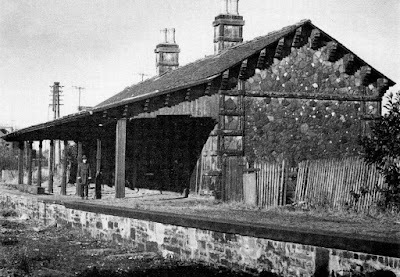 The next pic is of Lochee Station, probably taken some time in the '60s (despite the ancient appearance of the figure in it) after it, too, had closed. The spot where I pitched my tripod is just yards from the old station building which is now a social club. When I got to my location, there was a fence preventing people from falling off the parapet and some tall weeds beyond it. I set the Rollei SL66E up on the tripod, mounted the 40mm Distagon and mucked around with a couple of compositions. Could I get a shot without all these bloody weeds in view? I could not. Off came the camera and the tripod was extended and used as a blunt machete to hack down as much of the offending flora as possible. There were a few weeds that were still out of reach - they make an appearance in the bottom right of the frame. I would have had to have climbed over the fence to get to them but then one slip and I'd probably have been found road runner style on the pavement below. Cowardice being valour's much under-rated sibling, I stayed on the right side of the fence. Suffering for my art is one thing, breaking a leg for it quite another. The Distagon has handled the scene very well. 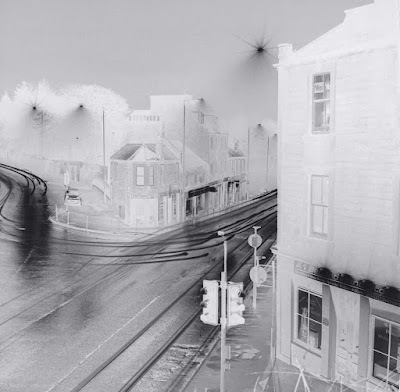 The negative is nice and sharp and there's very little distortion. 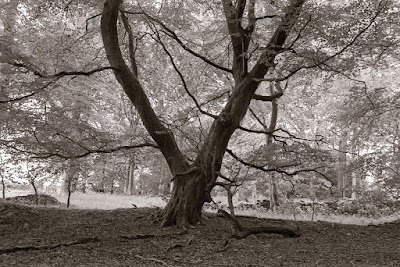 The Tmax 400 neg has all the detail I could reasonably want in it. There's a little bit more highlight detail in the neg than there appears to be in the iphone pic of it above. The scan at the top of this post is darker than I'd ideally print the shot in the darkroom but that's mainly to cover up the rotten scan! I don't know why I don't do more night photography as I love it. It's not just that the images are so different from what I usually shoot but it's also the serenity that comes from being on the streets in the dark with very few bodies about. It might spook some people, I suppose, but I like the sense of calmness that descends, particularly in the fog. Is anyone else reading this a keen night snapper? I get the feeling that somehow the negative number on the backing paper has somehow become imprinted onto the negative. Are you sure that your "14" isn't actually a number 4? Kodak did have some issues with backing paper a while back. It is possible you have a roll from one of the bad batches. A quick internet search should find the relevant batch numbers. Annoying, but hopefully now fixed. Another option would be to try and intensify the 14 when you print so that it's really obvious. Then it can be a talking point for the photo. As I said to you earlier Bruce - this is one of the best night shots I have seen in a long time - you have managed to balance intrigue, cars and murkiness, which it not an easy thing to do! I love it. As for the 14's, could be an alien flyby - print them out with a bit of burning, it won't affect the quality of the image at all. Yet again though, you've succinctly put the history of the place into the post - I've driven past here a zillion times, had chips from the Bridge chippie; often thought about what it would have been like if they'd left the railway span in place and generally taken it for granted. I had no idea about the sandbags. You know, for the fact that Dundee is generally considered to be the arse-end of nowhere by most people in Scotland, it is little facts like you have detailed, that highlight the gritty history of the place. If the Council had more imagination they'd be highlighting little stories like this - it is fascinating. Actually, yeah, make the 14's OBVIOUS! Great idea. I've got a picture of a dead deer somewhere where the number of the frame intrudes heavily into the picture and it works somehow. I ilke the image very much. As Herman says: you have a great eye Bruce. And a keen talent for self portraiture too ;). The Kodak backing paper problem is well known. I had 20 rolls in the affected batches and Kodak sent me replacements. Thanks for that, Frank. Interesting thread. Seems to explain the problem very well. Great night photo Bruce ........ Never come across the 14 issue though and interesting to read here that it’s a known problem with some batches of film. Has anyone told you your a spitting image of a well known American coffee seller? In any event, it looks a lot like what you've got going on. Interesting stuff, Dave. Thanks for the links.